Martyn Hilbert's Railway Photography - Industrial Locomotives - Fowler 0-4-0 Diesel 4210140 at the Texaco Sales Terminal, Granton Edinburgh. Fowler 0-4-0 Diesel 4210140 at the Texaco Sales Terminal, Granton Edinburgh. A quiet Sunday afternoon at the Texaco Fuel Sales Terminal at Granton, Edinburgh with the resident Fowler 0-4-0 Diesel Shunter and four TTA Tank Wagons on July 20th 1981. The diesel was a 150hp machine, works number 4210140 dating from 1958. Access to such installations in those days was usually not a problem, the owners welcoming an interest in an often ignored part of the railway system. 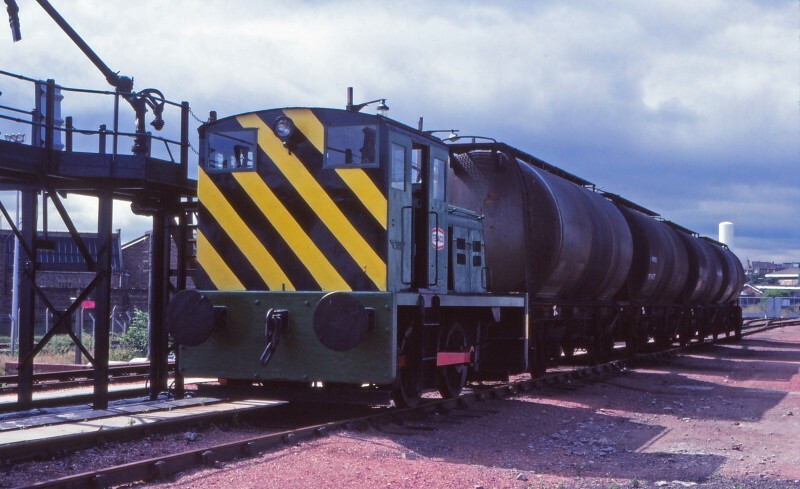 The locomotive passed to the SRPS in 1984 and is now part of the collection at Bo'ness.